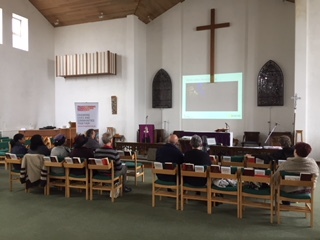 Bill Mash, who leads Black Country Urban Industrial Mission, gives us his thoughts following a recent modern slavery training from James Henderson, our project lead in the Diocese of Lichfield. "When you watch a video about vulnerable people being rescued from being trafficked and exploited, and you see a familiar Black Country landmark in the background, you realise that this is a this is an issue which affects us all. Another short but hard hitting film in James Henderson’s excellent introductory seminar showed us modern slavery from the view of the criminals. The numbers of ways in which they can exploit people and make money out of their plight was shocking. They have the potential to make high profits with low risk. This shock is compounded for us, because with our faith comes a belief in people’s God given dignity and their right to flourish and to enjoy the rewards of their work. We looked in detail at signs which might indicate that people are falling short of this, signs which could be evident at the school gate or when people visit a church run food bank. Those caught up in exploitative domestic servitude may be allowed out for to attend church. In many ways modern slavery can be hidden in plain sight, and people can be held captive by psychological pressures and threats. We may well come across them and it is important to be aware of what we see and what we can do about it. 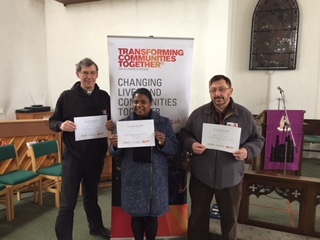 A few trainees with their certificates! A great deal is being done, both in terms of legislation and by charities and agencies. A helpline has been set up – 08000 121 700, and we are urged to report any concerns we might have. There are an estimated 11,700 victims in the UK, and with the West Midlands being an area of cheap housing and good road links, there will inevitably be many of these people in our communities. They may be working in nail bars, car washes and construction sites, or being bused out to do agricultural work in surrounding areas. James’ seminar helped us understand the nature and scale of the problem and gave us the confidence to know that we could help in combatting it." Want to learn more about modern slavery? See if we are running a training near you on our Training page.